Similar to other programming languages, in Python, conditional situations can be handled using if command. This is the Python if statement syntax. The following examples will show how this syntax can be used properly. The following example illustrates how to use if command in python when we are doing a conditional testing using numbers. 1st line: Here, we are asking for user input. The input will be an integer, which will be stored in the variable days. 2nd line: This is the if command, where we are comparing whether the value of the variable days is equal to the numerical value 31. The colon at the end is part of the if command syntax, which should be given. 4th line: This line is outside the if statement block. So, this will get executed whether the if statement is true or false. The following is the output of the above example, when the if statement condition is true. The following is the output of the above example, when the if statement condition is false. The following are the various operators that you can use in the if command for conditional checks. Similar to the previous example, we can also use Python if command for string comparison as shown in the example below. 1st line: Here we are getting the raw input from the user and storing it in the code variable. This will be stored as string. 2nd line: In this if command, we are comparing whether the value of the code variable is equal to the string ‘CA’. Please note that we have enclosed the static string value in single quote (not double quote). The : at the end is part of the if command syntax. 3rd line: As explained in the previous example, this line will get executed when the if command condition is true, as this line has indentation with spaces at the beginning. 4th line: This will get executed whether the if command condition is true or false. The following is the output of the above example code for both if condition true and false. In the previous example, we had only one statement to be executed when the if condition is true. The following example shows where multiple lines will get executed when the if condition is true. This is done by doing proper indentation at the beginning of the statements that needs to be part of the if condition block as shown below. 3rd line – 6th line: All these lines have equal indentation at the beginning of the statement. In this example, all these 4 print statements have 2 spaces at the beginning. So, these statements will get executed then the if condition becomes true. 4th line: This print statement doesn’t have similar indentation as the previous commands. So, this is not part of the if statement block. This line will get executed irrespective of whether the if command is true or false. The following is the output of the above example, when the if statement condition is true. Here all those 4 print statements that are part of the if condition block gets executed. 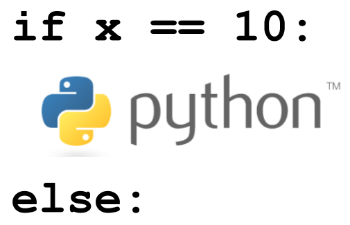 The following example shows how to use if..else command in Python. 3rd line: This line starts with two space indent at the beginning. Any line (one or more) that follows the if statement, which has similar indentation at the beginning is considered part of the if statement block true condition. 4th line: This has the else keyword for this if block. The colon at the end is part of the if..else command syntax, which should be given. 5th line: This line starts with two space indent at the beginning. Any line (one or more) that follows the else statement, which has similar indentation at the beginning is considered part of the if statement block false condition. 6th line: This line is outside the if statement block. So, this will get executed whether the if statement is true or false. The following example is also similar to above example, but this if..else uses string variable for comparision. The following is the output of the above examples, when the if statement condition is false. i.e The else block will get executed here. In Python, if else if is handled using if elif else format. The following example shows how to use if..elif..else command in Python. When the first if code == ‘CO’ condition fails, then it goes to the next elif command. When the elif code == ‘CO’ condition fails, then it goes to the next elif code command. When the elif code == ‘CT’ condition fails, then it just executes whatever is available as part of the final else: block. At any point when the 1st if condition becomes true, or any one of the remaining elif condition becomes true, then it executes the statement that is part of its block and stops checking further condition. This also means that when any of the if condition or elif condition becomes true, the statement that is part of the else block will not get executed. Also, just like previous example, the colon at the end of if, elif, else command is part of the Python syntax, which should be specified. The following is the output when the first if condition becomes true. The following is the output when the first elif condition becomes true. The following is the output when the second elif condition becomes true. The following is the output when the if condition is false, and all the remaining elif condition is also false. Here this, executes the else block. The following example shows how you can use compound conditional commands in the if statement. The print block will get executed only when the if condition is true. Here, we are using a compound expression for the if statement where it will be true only when a is less than b and b is less than c.
The following is the output when if condition becomes true. The following is the output when if condition becomes false. You can also use the following operators in the python if command expressions. and x and y True only when both x and y are true. or x or y True if either x is true, or y is true. not not x True if x is false. False if x is true. The following example shows how we can use the keyword “and” in python if condition. The if statement will be true only when both the condition mentioned in the if statement will be true. i.e x should be greater than 10 AND x should also be less than 20 for this condition to be true. So, basically the value of x should be in-between 10 and 20. The following is the output when if condition becomes true. i.e When both the expressions mentioned in the if statement is true. The following is the output when if condition becomes false. i.e Only one of the expression mentioned in the if statement is true. So, the whole if statement becomes false. The following are some of the error messages that you might see when using the if command. This IndentationError error happens when you don’t give proper indentation for the statement that is following the if command. The same SyntaxError will happen when you specify an operator that is invalid. In this example, there is no operator called -eq in python. So, this if command fails with syntax error. You’ll also get similar syntax error when you specify elseif instead of elif.